Need an effective scalp care conditioner for a sensitive, itchy, dry scalp to maintain hair and scalp condition? The importance of maintaining both hair and scalp in good condition cannot be overlooked. 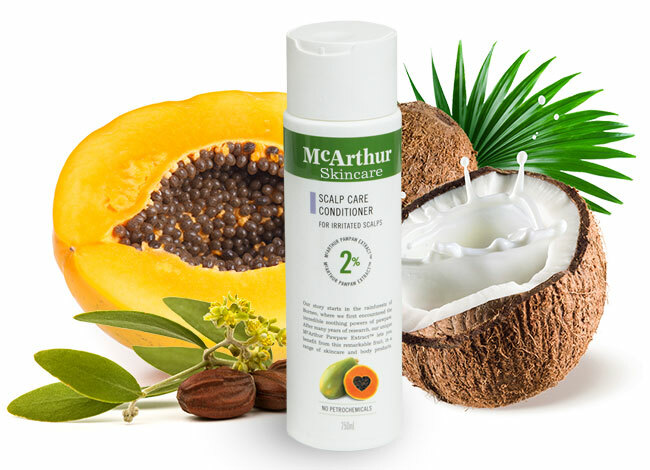 McArthur Skincare's Scalp Care Conditioner has been created as the partner to our Scalp Care Shampoo to maximise the reinvigorating power of Pawpaw (Papaya, Papaw) and other natural ingredients in maintaining good scalp and hair health. McArthur Skincare's Scalp Care Conditioner has been created to harness natural ingredients that can help maintain both your hair and scalp in good condition, so your hair looks and feels natural, nourished and vibrant. Containing McArthur Pawpaw Extract™, our McArthur Skincare's Scalp Care Conditioner is formulated for sensitive, dry, flaky or itchy scalps. This revitalising conditioner uses the unique qualities of Pawpaw (Papaya, Papaw) to nourish and create more manageable hair. It is the perfect partner to McArthur Skincare's Scalp Care Shampoo. No fragrance has been added to this conditioner to cater for the most sensitive scalps. Main active natural ingredient: Pawpaw (Papaya, Papaw). McArthur Skincare's Scalp Care Conditioner also includes ingredients derived from Coconut and Jojoba Seed Oil. Sulphates: These are, in general, drying ingredients found in many shampoos. We developed McArthur Pawpaw Extract™, a highly concentrated form of Pawpaw (Papaya, Papaw), as a key ingredient in all our skin and haircare products. 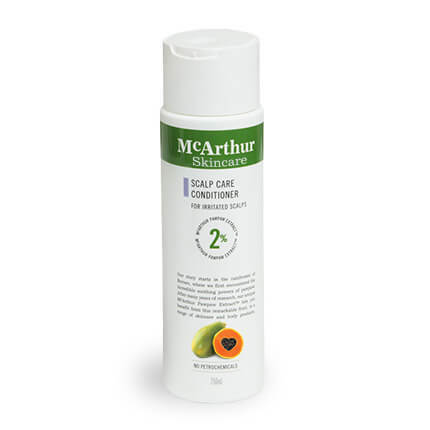 For anyone who wants hair and scalp care products that are based on natural ingredients, McArthur Skincare's Scalp Care Conditioner used with McArthur Skincare's Scalp Care Shampoo together provide good maintenance for a calm, soothed scalp and smooth, healthy, vibrant hair. All products in the McArthur Skincare hair care range contain natural ingredients. McArthur Skincare's Scalp Care Shampoo should be stored at a temperature under 30° Celsius. After using McArthur Skincare's Scalp Care Shampoo, massage a small amount of our Scalp Care Conditioner into wet hair and leave on for 1 to 3 minutes. Rinse well and repeat is necessary.